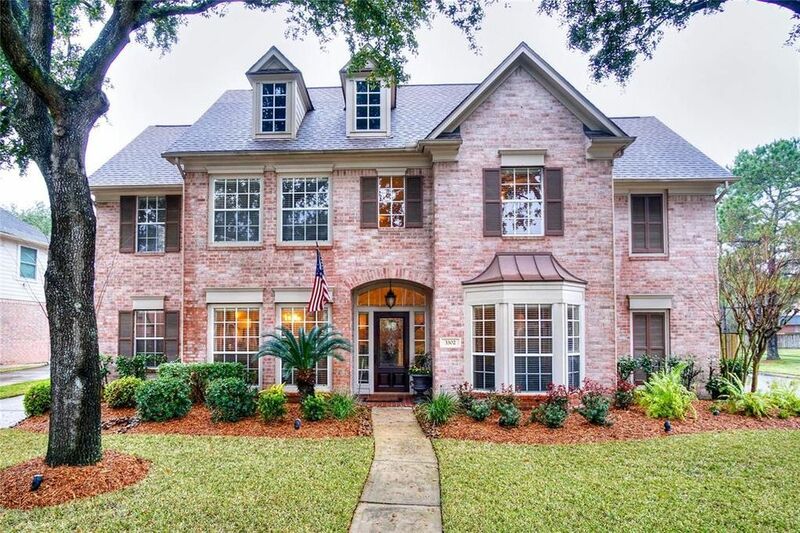 Gorgeous 4 bed 3.5 bath home with its own private backyard retreat & situated directly across from the neighborhood park! Upon entry you are greeted by both an executive study & an elegant dining room with easy kitchen access, making it a true entertainers dream! Passing through the entryway you come to a large family room featuring hardwood floors, a stone fronted fireplace, built-in bookshelves & windows that shower the space in natural light! Create your favorite recipes in the beautiful island kitchen equipped with granite countertops, tile floors/backsplash, stainless steel appliances & ample storage space! In the evenings, withdraw to the spacious master suite complete with wood floors, bay windows & French doors leading into a luxurious bathroom that showcases walk-in his/hers closets, tile floors, a whirlpool soaking tub & a walk-in shower! Game room & 3 secondary bedrooms up! The home also features a backyard with a pool, spa & a patio with a built-in pergola! Don't miss out! Directions: From I-10 W, exit on TX-99 S, Take the Cinco Ranch Blvd exit, left on Cinco Ranch Blvd, right on Cinco Lakes Dr, left on Sandmist Dr, right on Clear Water Park Dr, home will be on the right.